Osteopathy is a dynamic physical therapy. During a course of treatment, the body changes and adapts as the problem areas unwind themselves until a stable point is reached and the pain is diminished. The demands of modern life challenge the body to cope with things it was never designed to do, so it's no wonder so many of us suffer pain at some point. As a profession osteopathy has a broad base of disciplines ranging from strong structural work, often associated with cracking sound as adjustments are made, to the much gentler, subtle, although very potent cranial osteopathy. Every osteopath tends to work in their own individual way depending on their background training and preferred technique approaches. At Redhill and Reigate Osteopathy, osteopath Adrian Steel incorporates several of these treatment approaches and tailors them to meet the needs of each individual patient. He works to bring the body back into balance, correcting any misalignment to the spine or pelvis and uses gentle, but very effective techniques to release residual and painful areas of muscle tension. 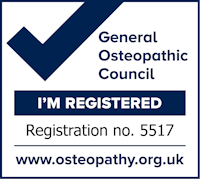 A course of osteopathic treatment at Redhill and Reigate Osteopathy is on average is about 5-6 sessions over 3 month period. This will vary with each individual presentation as age and lifestyle factors will have an influence. The first 2-3 sessions to be on a weekly basis to stabilize the problem and diminish the pain. Then, as symptoms improve the time gap between each treatment is stretched out to 2 weeks then a month and so on in order to reinforce the positive changes the body has undergone. Where lifestyle or work posture issues have attributed to the initial complaint, self help advice is given. Following an initial course, occasional 'top up' treatments may at times be beneficial in preventing a painful and disruptive episode from returning.